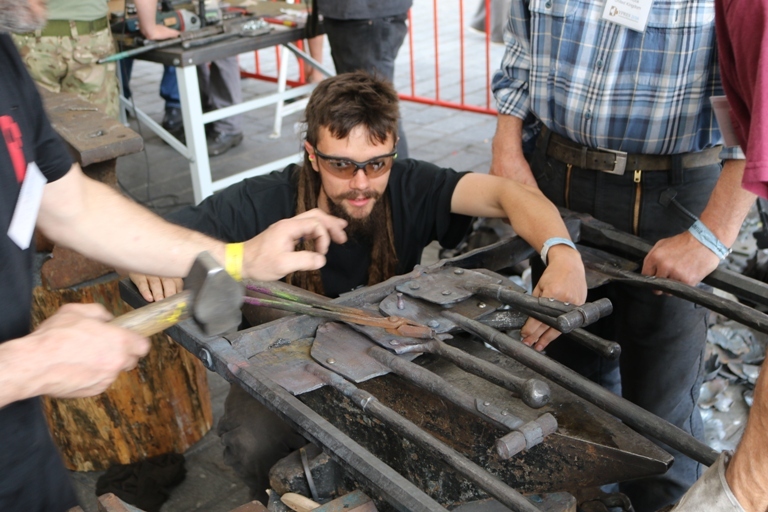 Ypres in Flanders saw a fantastic turnout for its week long International Blacksmithing event last week. 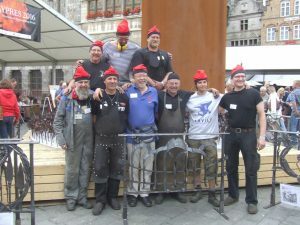 Bringing together blacksmiths and farriers from around the world to create a stunning new World War 1 Cenotaph for the 21st Century, the cenotaph will stand as a beacon of hope for future generations, commemorating all those who died, survived and were affected by the conflict 100 years ago. 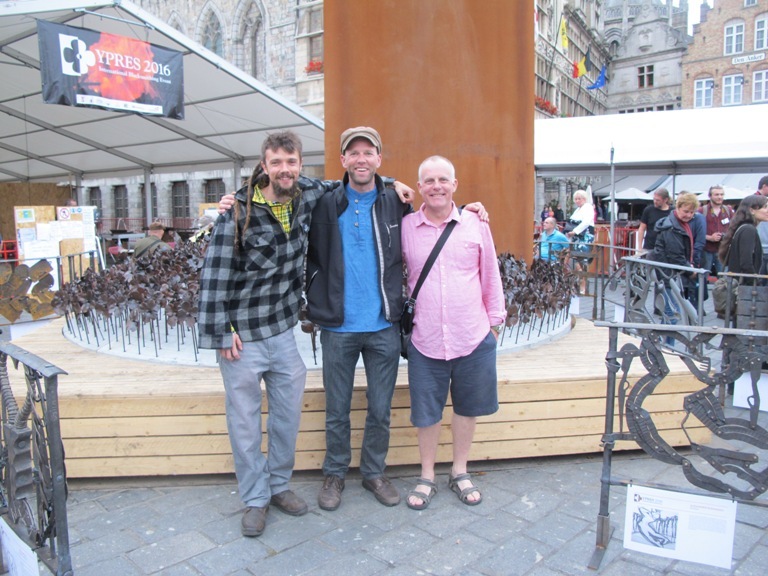 Represented by Andy, Alan, Alan’s wife Helen and James, Ironart was proud to attend and take part in this unique event, travelling the return trip of 580 miles by camper van and bicycle, via the Channel Tunnel. 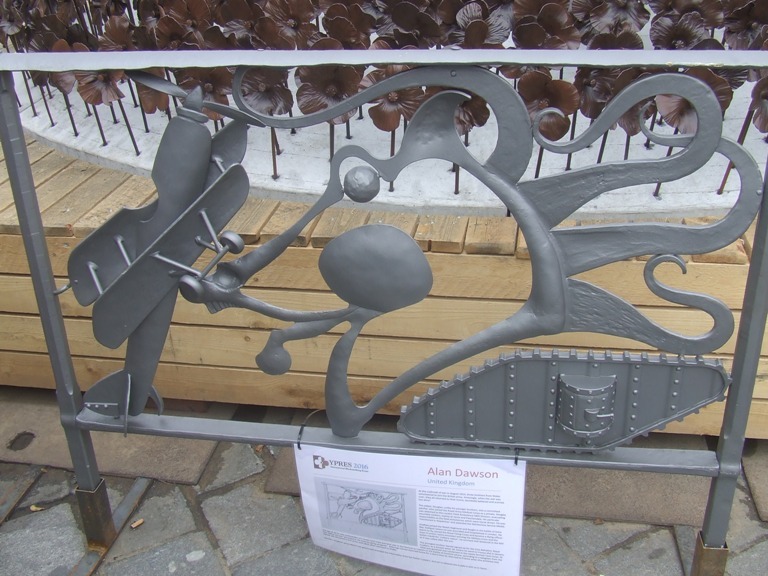 Over the six day event, the town saw parades and events to commemorate the Great War and all those who suffered, including the laying of a wreath of poppies forged by children. 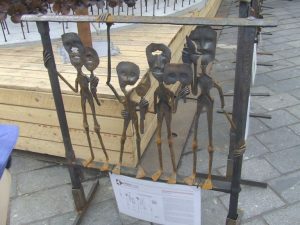 Alongside the forging spectacle, ‘Transition’, an exhibition of contemporary forged metal design, was also on display. 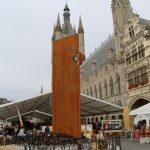 The international exhibition will tour the UK and mainland Europe finishing in London as part of the centenary Armistice celebrations in 2018. Alan checks over the precious cargo! 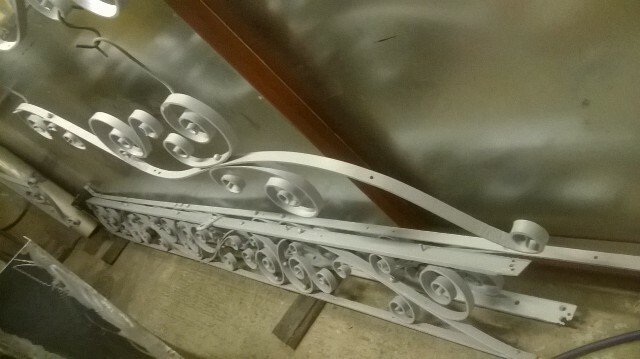 We recently blogged about the beautiful <<16th Century gates>> we’ve been working on for a private residence in Wiltshire. 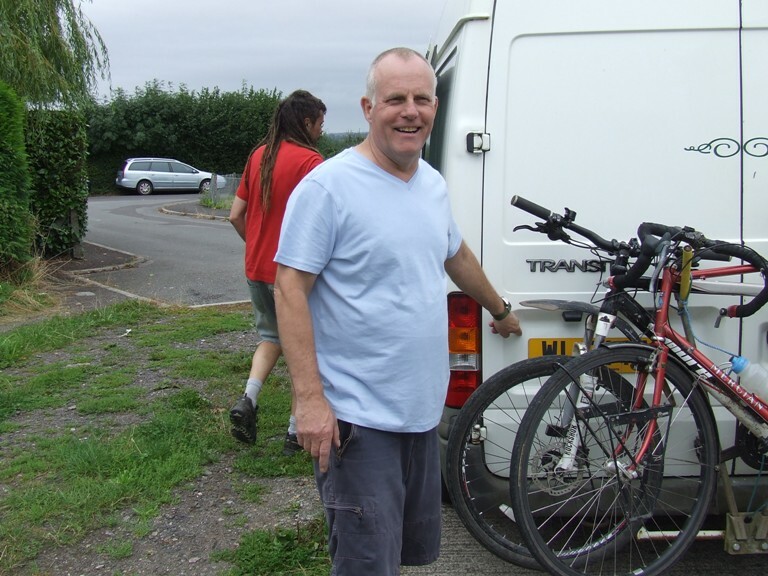 As promised, here’s the next instalment…. Having made all the intricate adjustments and ensuring that all the tenons fitted tightly, riveting of the outer frame could commence. 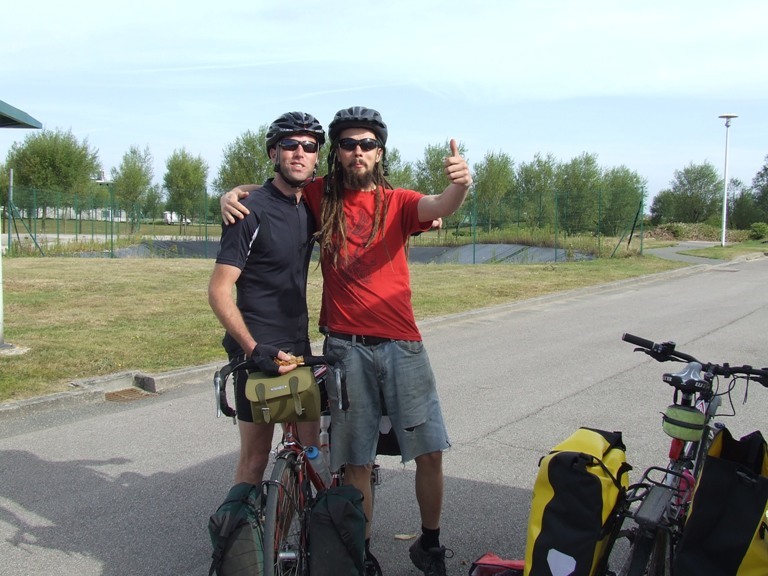 To do this precisely and safely (bearing in mind each gate weighed approx. 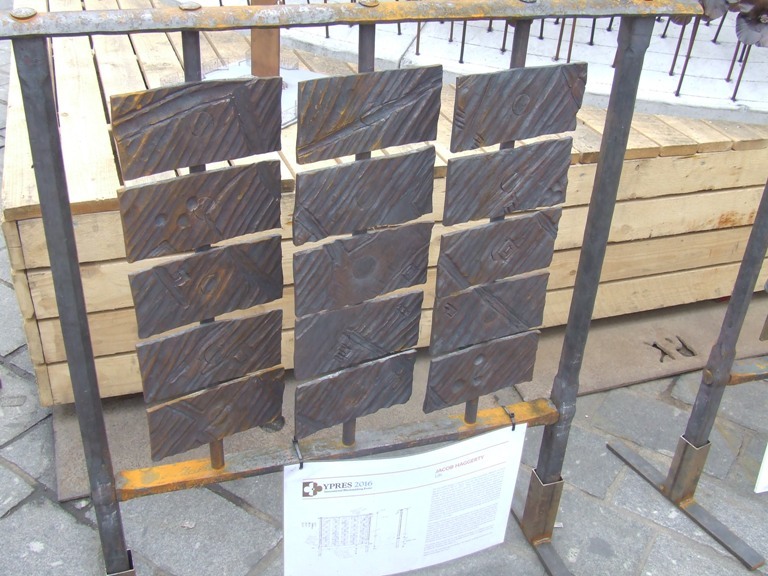 450kg), each gate was clamped in several places to ensure that there was no movement when the tenons were forged shut. We blogged about this project two weeks ago. The team are continuing to restore the Bartlett Street sign overthrow here in the Ironart workshop. 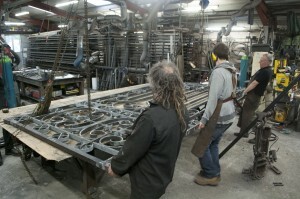 These pictures tell the story of the restoration work as it progresses under the expert eye of Martin Smith. 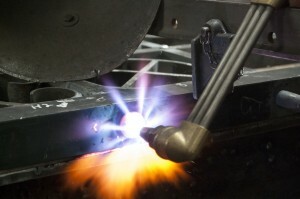 For more information about Ironart’s Restoration services follow this link to that area of our website. 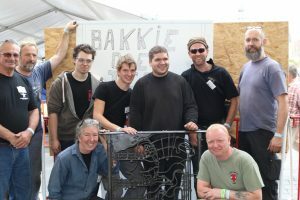 If you have a project in mind and would like some advice about where to start, please get in touch. 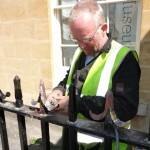 Martin and Alan carried out the repairs on site, some of the finials had decayed and some were fractured upon impact. 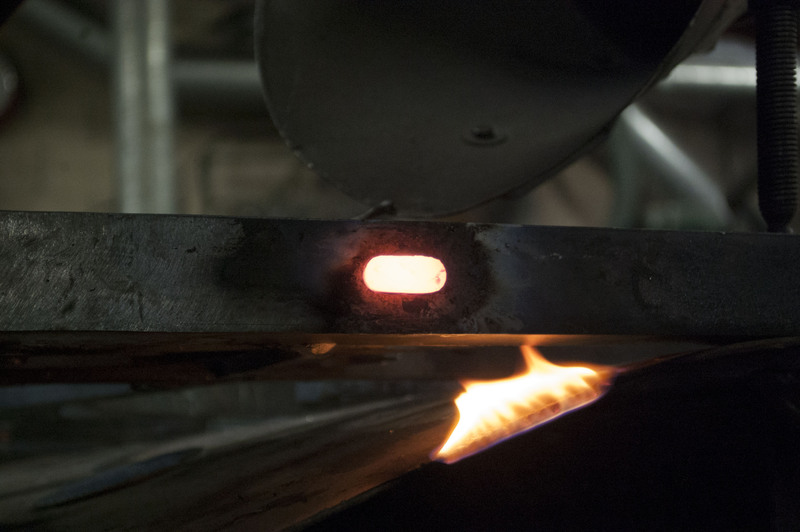 It was obvious that there had been some previous repairs carried out as there are some mild steel replacement finials (probably done in the 1980’s) which were lacking in refinement. 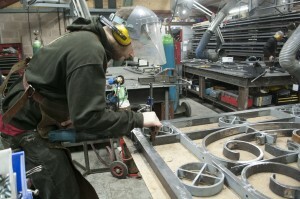 The team repaired seven railing finials in total. 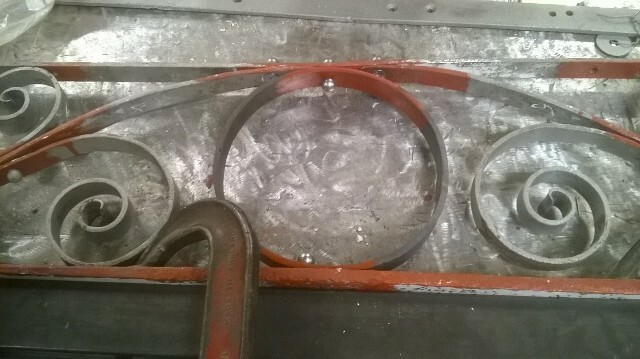 The original leaves were all salvaged and reused, Martin and Alan carefully brazed to fill the holes and damaged sections. The new versions were cut off and replaced with more delicate versions! 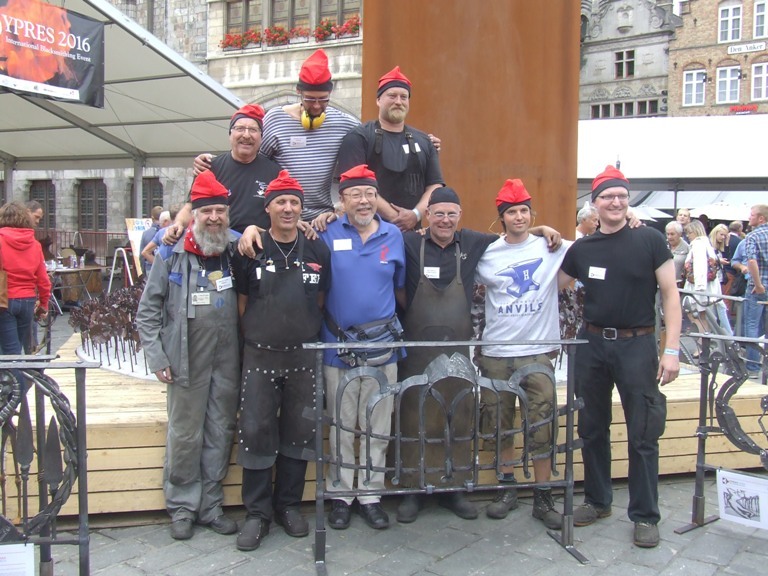 An interesting project in a very prestigious location – and satisfying to know that Ironart had a role to play in the history of the Assembly room railings. 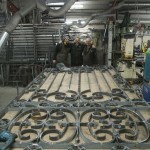 Adrian and Dom have just put the finishing touches to this wondrous double bed frame for a client in Salisbury. This was an original design by Andy Thearle, incorporating plenty of lovely forging and collaring details – it took many, many hours of painstaking work to complete but it has been well worth the effort! 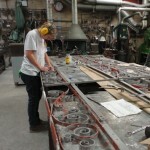 The neat bedside tables were designed to match the bed, and will be finished off with slump glass shelves. 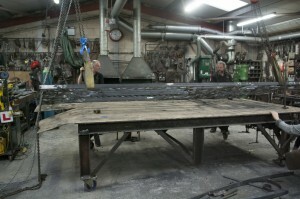 The bed is just about to go into the paint shop for a satin black paint finish. Bespoke forged beds are not ideal if you are on a tight budget, but a handmade piece of art like this will hold it’s value and give you something to hand on to the next generation. We do love this type of forgework, so if you have an idea in mind and want to discuss it with Andy or one of the team, please get in touch. 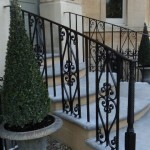 Ironart’s Jason Balchin, Alan Patterson and Adrian Booth made these symmetrical handrails as part of a much bigger project incorporating double gates and railings for a lovely period house in Weston on the edge of Bath. 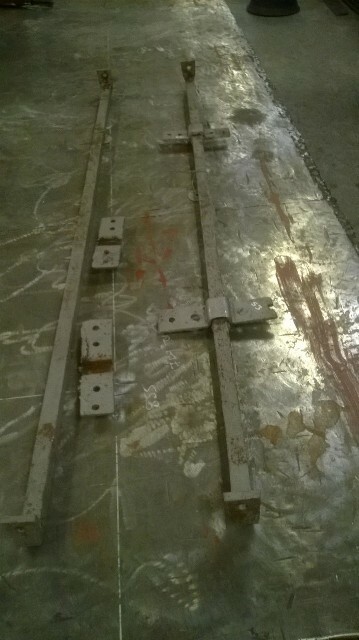 The team reclaimed the original top strap from pre-existing handrails on the steps. 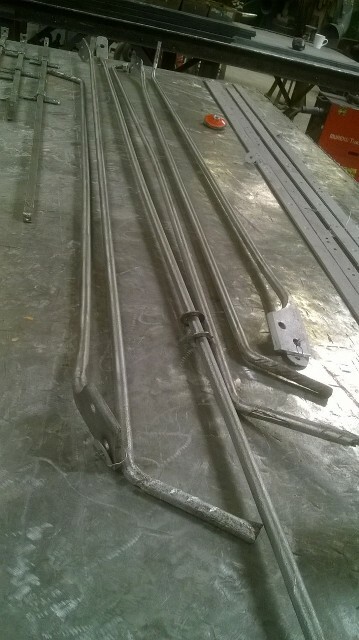 These handrails incorporate decorative cast iron newel posts and were individually leaded in on site by Luke Hannaford. 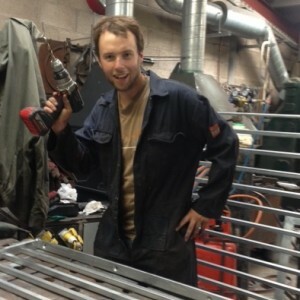 For more examples of bespoke gates and railings please visit the bespoke portfolio on our website. 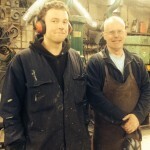 We are delighted to welcome two new blacksmiths to the Ironart team. 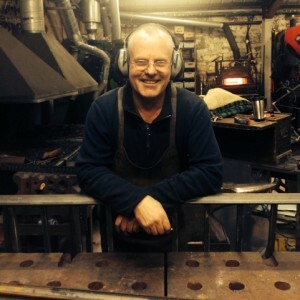 Alan Patterson is a highly experienced smith with many years of forging and some illustrious blacksmithing projects to his name. 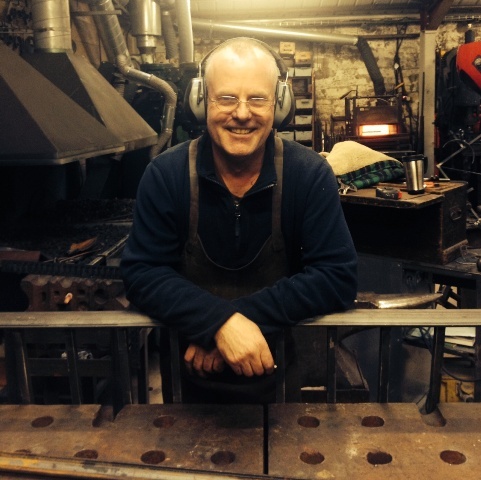 Before joining us here at Ironart, Alan ran Somerset Smithy in Frome. Alan’s knowledge will be a great asset to Ironart and we are really looking forward to working with him. Adrian Booth recently graduated from Hereford college and came to us to gain on-the-job experience. 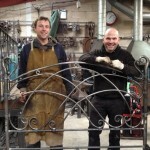 During January Adrian worked with Jason on the Regency walled garden gates we have just completed and did a top job, earning high praise from his colleagues! 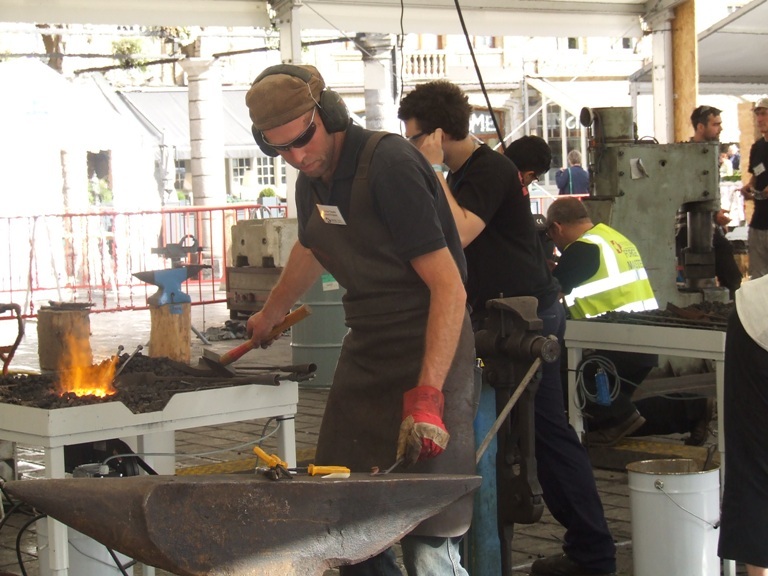 He’s proving to be an invaluable member of the team and we look forward to tracking his career as a talented artist blacksmith of the future.